Now I see why juiicy declined the invitation. I personally wasn't entertained except for when 50's mic was cut off for the first half of his performance. With Yayo yelling " whats wrong 50! whats wrong!" made me laugh even more but I could have saved it on the TiVo instead of watching it live. A lot of funny things went down so I'm going to give you the scoop. 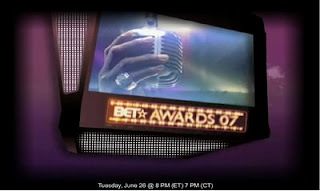 I heard during the red carpet, Rihanna was held back by the B.E.T. staff until Beyonce clear the red carpet because of their "beef"
I heard Ciara WAS sitting next to 50 during the beginning of the show when the camera spotted them together. She moved afterwards when Yayo came to take his seat next to 50. I'm confused there is a "rumor" posted that Rhianna was held back until Beyonce went by or whatever and then a pic further down of the two of them together?? I hated everything save for the Jennifers! I am amazed you posted them last. Beyonce stole her idea from Kiley, but what else is new?